French Channel NRJ has launched an unencrypted test in Ultra HD. 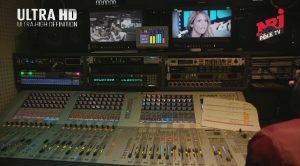 The service is called Test technique UHD NRJ. The test broadcast consists of a 2-minute cycle promo clip. The channel appeared on one of the transponders used by SES for testing, replacing the HDR test 2, which had been been experimenting UHD in High Dynamic Range. The image is broadcast at a resolution of 3840×2152 (2160) with a flow rate of approximately 19,47 Mbit/s, sound is transmitted in E-AC3, 2.0 (stereo), bitrate 224 kbit/s. The large Ultra HD logo appears on the left of the screen, on th e top right the NRJ Pole TV logo. It was created in cooperation with Harmonic, Video Plus, Magic Hour, Samsung, TPV (Philips), Hisense, Rohde & Schwarz, Mypostprod and DVS. This is the firstUltra HD channel from France.